Parson Russell Terriers are generally a healthy, hardy, long lived breed. They have a great zest for life, and are always ready to join in whatever fun there is to be had! 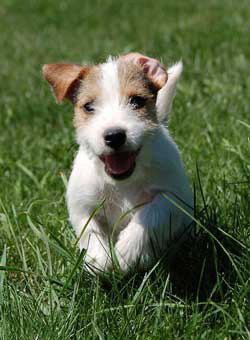 One can start their search for a parson russell terrier puppy/adult by visiting the breeder referral page. When talking to a breeder about adding a puppy/adult to your family, you would want to ask about any health testing that the parents have had done. You would want to know that the parents have had their eyes checked by a board certified ophthalmologist and are clear of hereditary defects. That both parents had a BAER test done and certified that they have normal hearing in both ears, and that both parents have had their patellas checked and cleared by a veterinarian. Results can be provided to you in the form of copies from the breeder, or results can be submitted to the Orthopedic Foundation for Animals to become part of a permanent database. Puppies/adults should be up to date on vaccinations/worming before going to a new home. You should take your new puppy/adult to your own veterinarian for a wellness check-up within the first couple of days. Don’t be surprised if the breeder asks you more questions, than you do of them! Careful placement of puppies /adults is of the utmost importance to the breeder. Breeders have put in countless hours of nurturing their dogs and puppies , and placing a happy, well socialized puppy/adult in a loving home is what we all strive for.